Lightly warm 220 g milk in the microwave and stir in 25 g dried yeast until it is dissolved. In a large bowl, mix 1 egg with 550 g bread flour and add the milk mixture. Knead well, cover with cling film or a dry tea towel and leave to rise until doubled in size. Knock the air out of the dough, add 10 g salt, 25 g sugar and 125 softened butter cut in cubes and knead until you get an elastic dough that no longer sticks to your work surface (about 5 tot 10 min). Allow to rise until doubled in size. Knock the air out of the dough and split in to two. From each half, keep a small piece (100 g) apart. 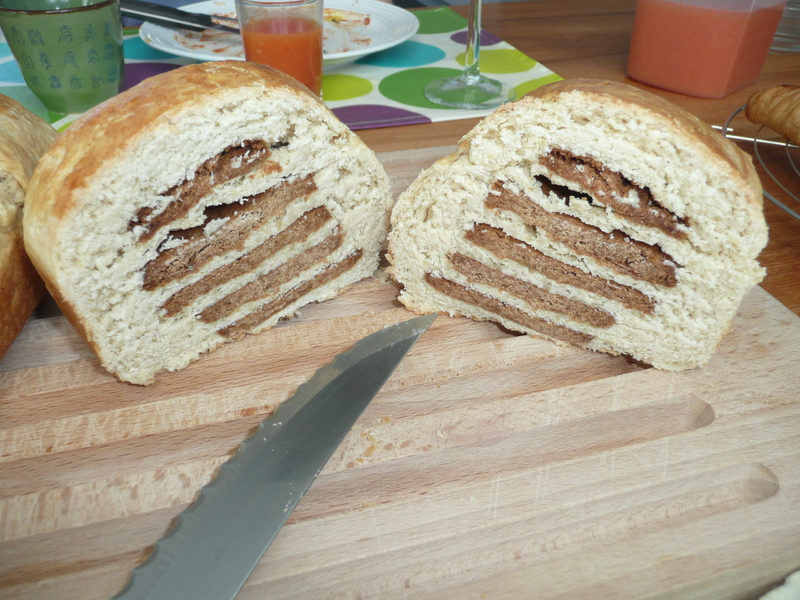 Roll out the big piece to a long rectangle and put a speculaas biscuit at the long end of the rectangle. Flip the dough with the cookie over, add another cookie and continue until you reached the end of the dough (you need about 200 g speculaas biscuits in total for the 2 breads). Roll out the small piece to a rectangle as well and use it to wrap your rolled bread in. Repeat with the second batch. Put in a buttered loaf tin, brush with a beaten egg and leave to rise for another 45 min. Preheat the oven to 160 C and bake for 25 min or until the bread sounds hollow when tapped on the bottom. If you don’t have speculaas biscuits, I’m sure this will work with other biscuits as well, it’s easiest if you use rectangular once. I think ginger biscuits would taste great as well. Enjoy! Preheat the oven to 180 C and cover a baking sheet with baking parchment. In a bowl, mix 180 g oatmeal with 45 g dried apple cut in small pieces (I use scissors, much easier), 70 g skinned almonds (left whole – if you only have some with skin on, that’s fine too), 100 ml apple sauce, 2 tbsp maple syrup and 1 tsp cinnamon. Spread it out on your baking sheet and put it in the oven for 30 min, stirring every 10 min. Cover loosely with a sheet of aluminium foil for the last 10 min or so as the apples burn easily (so keep a close eye on it). Remove from the oven and allow to cool completely. 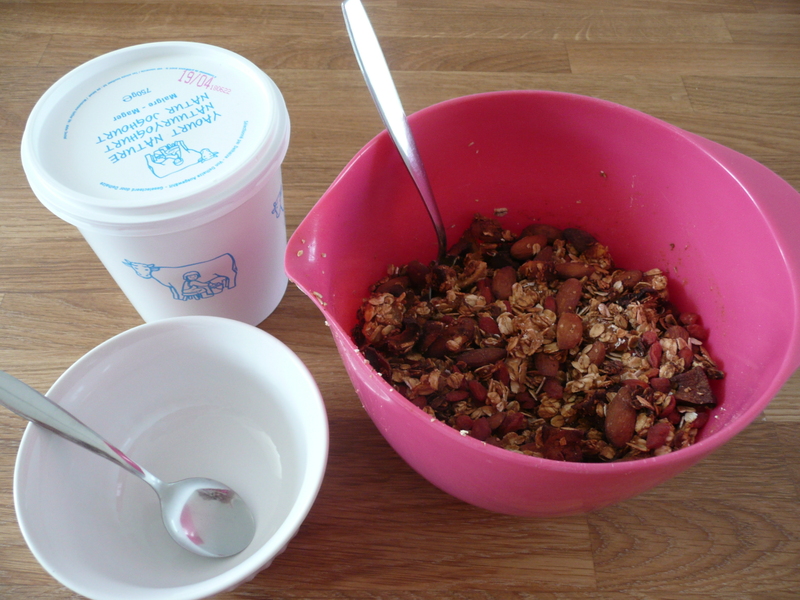 Transfer to an airtight tin and add 50 g goji berries and 40 g wheat (or oat) flakes. You can keep it in the tin for 2 weeks. Eat with some yoghurt or milk. You can add pieces of fresh fruit as well. Enjoy! Put 500 g strong white flour and 1 tsp salt into a large bowl. Make a well in the centre and add a 7 g sachet fast-action yeast. Meanwhile, warm 300 ml milk and 40 g butter in a pan until the butter melts and the mixture is lukewarm. Add the milk mixture and 1 egg to the flour mixture and stir until the contents come together as a soft dough (add extra flour if you need to). Tip the dough onto a well-floured surface. Knead for 5 mins, adding more flour if necessary, until the dough is smooth, elastic and no longer sticky. Lightly oil a bowl with vegetable oil. Place the dough in the bowl and turn until covered in oil. Cover the bowl with cling film and set aside in a warm place for 1 hr or until doubled in size. Lightly grease a baking sheet and set aside. For the filling, knock the dough back to its original size and turn out onto a lightly floured surface. Roll it into a 1cm-thick rectangle. Brush all over with 25 g melted butter, then sprinkle over 75 g soft brown sugar, 2 tsp cinnamon, 100 g dried cranberries and 100 g chopped dried apricots. Roll up the dough into a tight cylinder, cut into 9 x 4cm slices and position on the prepared baking sheet, leaving a little space between. Cover with a tea towel and set aside to rise for 30 mins. 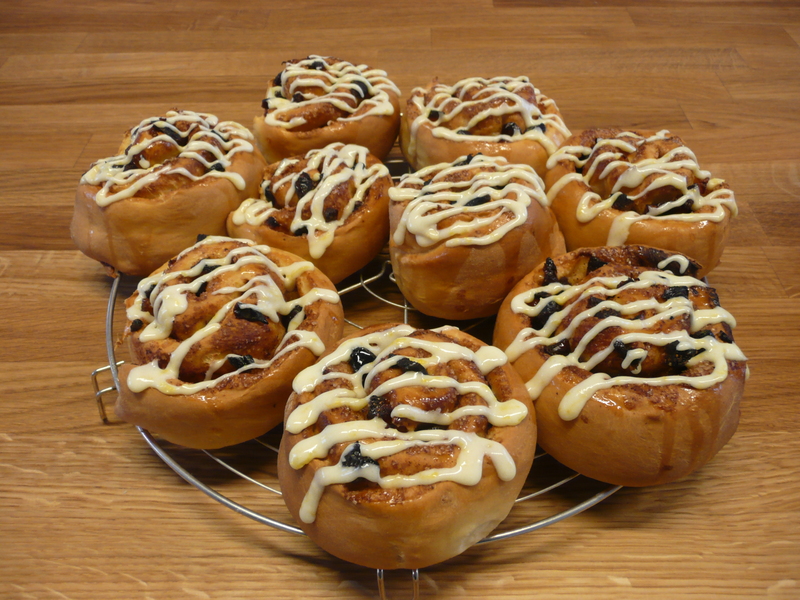 Heat the oven to 170 C. Bake the buns for 20-25 mins or until risen and golden brown. Meanwhile, melt 50 g sugar with 4 tbsp water until syrupy. Remove the buns from oven and glaze with the sugar mix. Set aside to cool on a wire rack. Once cool, mix the zest of 1 lemon and 100 g icing sugar with 1 egg white to make icing. Stir until you get a syrupy mix, add extra sugar if you need to. Drizzle over the buns. Enjoy while listening to Good King Wenceslas (hey I just love Christmas!) in the version of the Irish Rovers. Use up left-over apricots in an apricot and marzipan twist or a fruit cake. Use up leftover cranberries in white chocolate and cranberry cookies.